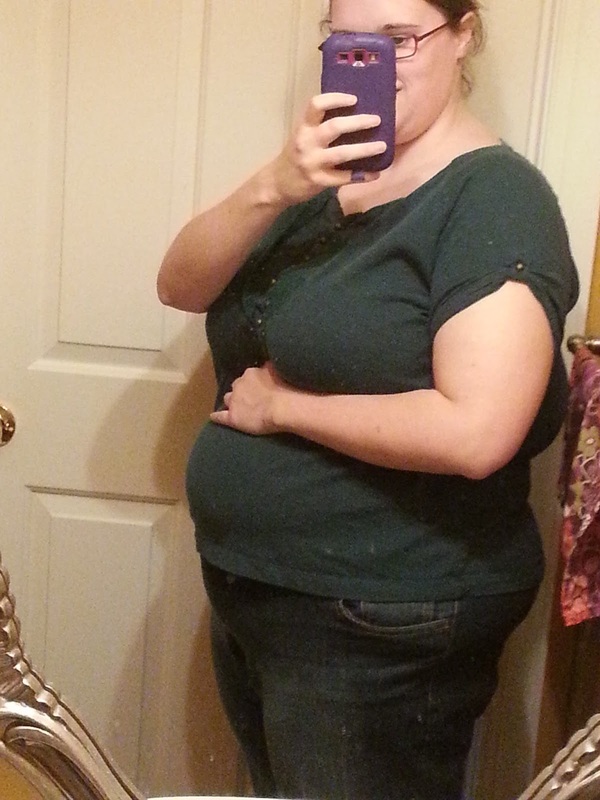 Okay, I'm actually 18 weeks today, but I was a slacker and didn't post last week. Here's the catching up! I have to admit, it's been a rough week. I was supposed to babysit for a friend, and after having a week of utter exhaustion and recurrent nausea, coupled with kids with runny noses, we ended up cancelling. I've been struggling with feeling 'down' lately, and trying really hard to not become antisocial, knowing that that will make any depression worse. I've been praying a lot lately, and certain phrases just keep going through my head, like this beautiful Hidden Word. O SON OF JUSTICE! Whither can a lover go but to the land of his beloved? and what seeker findeth rest away from his heart’s desire? To the true lover reunion is life, and separation is death. His breast is void of patience and his heart hath no peace. A myriad lives he would forsake to hasten to the abode of his beloved. I know it's all allegorical for a relationship with God, but I am constantly thinking of my relationship with your dad, and how fulfilling it is to both of us, and what I would do without him. I'm so wholly blessed to have such a wonderful man in my life, and you're so lucky to have him as a father. So without further ado, here is the journal, and a picture. Size of baby: an onion apparently. I really think they want me to crave guacamole. Gender: We don't know yet. We find out in 10 days though, and the party is in 12. Movement: Nope, but darn I keep hoping and waiting! How I'm Changing: My belly is getting bigger/rounder/harder. My hips and lower back are sore. My breasts are massive. Total Weight Gain/Loss: I dare not step on a scale. Maternity Clothes: Finally. I'm living in my two pairs of sweats, and one pair of jeans. I also dug up some really big leggings that look nice under a long shirt I bought. I really can't believe how short my t-shirts are getting. How I'm Feeling: Truthfully, I'm exhausted and lately a bit depressed. I feel alone a lot of the time, even when there is no reason to (like after spending a weekend with friends), and I feel like these hormones are playing tricks on me. I'm still having a hard time finding good/healthy foods that I want to eat, and suffered from a stomach ache all of last week. What I miss: feeling in control. Control of my body, how I feel, the energy I have, etc. I miss that exhilaration I felt when I lost weight and fit into smaller clothing. I miss feeling productive. What I'm Eating: Too much crap. This weekend was filled with brownies and steak, not healthy foods. Best Moment this week: probably peach picking on a gloomy Sunday morning. We wanted around 20 peaches and came home with 20 POUNDS because they were so beautiful and juicy. I'm also loving laying on my side and feeling how hard and round my belly is getting. Also...I got to hold my friend's 5 week old. She's beautiful and adorable, and makes the most precious noises.